Hi there. A few months ago my friend and I performed something like a gamedev experiment. It was 'just create a trashy game, update it as frequently as possible and make it better based on users’ and Google Analytics’ feedback'. We didn't want to spend 6 months on developing another game that will get stuck among thousands ofother games on Google Play. Moreover, we didn't have as much as 6 months. It was more like a quick execution of a half-witted idea. 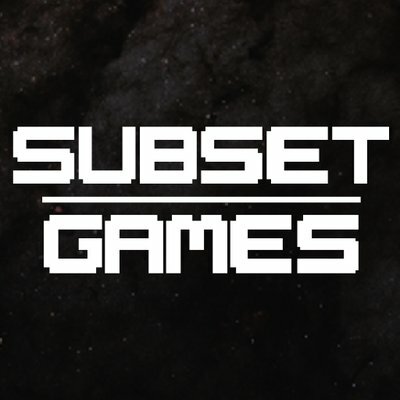 We wanted our game to evolve based on the user feedback and our conclusions. So, what was the idea for the game? 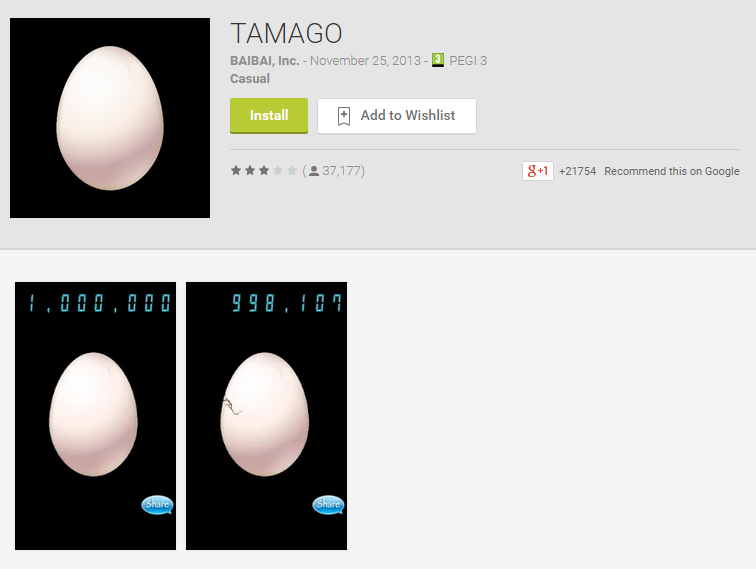 Every time I had a browse in Google Play I wondered how a game about tapping an egg can become so popular. ‘Over 5 millions downloads of a simple tapping app. Holy f*ck, what is going on here?’ - I asked myself. The game average rating was 3.0 and people still was downloading it. Apparently, the rating does not matter... You can clearly see that for Google Play the number of downloads is more important than the rating. This game is the first search result for the ‘egg’ keyword. Every time you tap the egg, you get closer to obtaining another pet. The next levels obviously become more and more difficult. The only challenge for the player was to collect all pets, nothing more. Boooooring.Now let’s take a look at some stats. 611 sessions in 2 weeks. No marketing. Just keywords and the game. Only 46.2% of returning visitors means that after a month or two, nobody will play this game anymore. The average session lasted only 3:03.First conclusions: Let's try to interest the player. Let's give more content to get a longer session duration. So when a player gets a new pet, why not let him take care of it? The number of new installations increased by around 20%! Returning visitiors ratio grew to almost 52%! 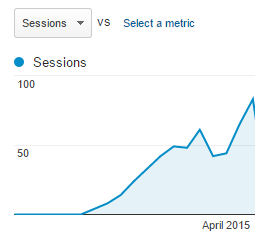 And... the average session duration almost doubled! That made sense! So it was time to draw more conclusions: There were a bunch of game events. We exactly knew what users did in the game. We analyzed the top events from the game and we came up with these results: the most popular event is ‘touching the ball’ (thanks to the physics engine that made it fun for the player). The users got 1 coin for 1 tap on the ball or the egg. 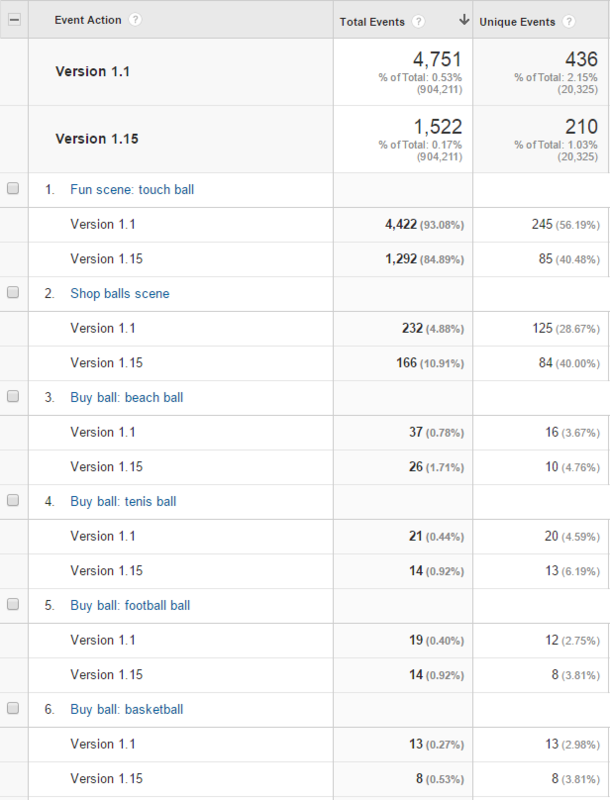 But we were surprised by how few users bought balls in the shop. Our conclusion was that they didn’t know how to earn money. They play the ball with their pets but they don’t know that it gets them money. The effect: In the 1.15 version there was over twice as much (6.77% to 14.99%) events related to buying balls! Ok, let’s add more stuff. It took more than a week to implement it but we added special indicators to show the levels of hunger, happiness and energy. Our goal was to engage the users more to take care of their pet or to return to the game more often. Playing ball with the pet also became more interactive as it could now play with us! The Effect: Over 57% of returning players. 5.5% more than in the previous 1.1 version! The average session duration grew to 7:22 and that is a 142% boost in comparison with the version 1.0 (3:03) and a 24% growth in relation to the version 1.1 (5:56)! OK. We had a simple pet care simulator, but we wanted to add more items to be available for purchase. They became expensive (there was inflation in our small game because we didn’t pay enough attention to economy in the game). For example, we made wallpaper available to be put in one of the rooms for 5000 coins. We thought we had to introduce a new way to earn more money so we implemented a mini game that made it possible. The mini game made it possible to earn up to 500-1000 coins in a 1-2 minute gameplay. What was the effect? 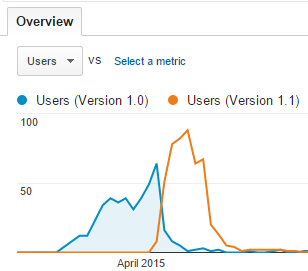 The retention growth up to 70.5%! It is 13% more than in version 1.2! It was definitely worth implementing. In this version we fixed some bugs and added more items and features to the game. It was the last update we made to this game. 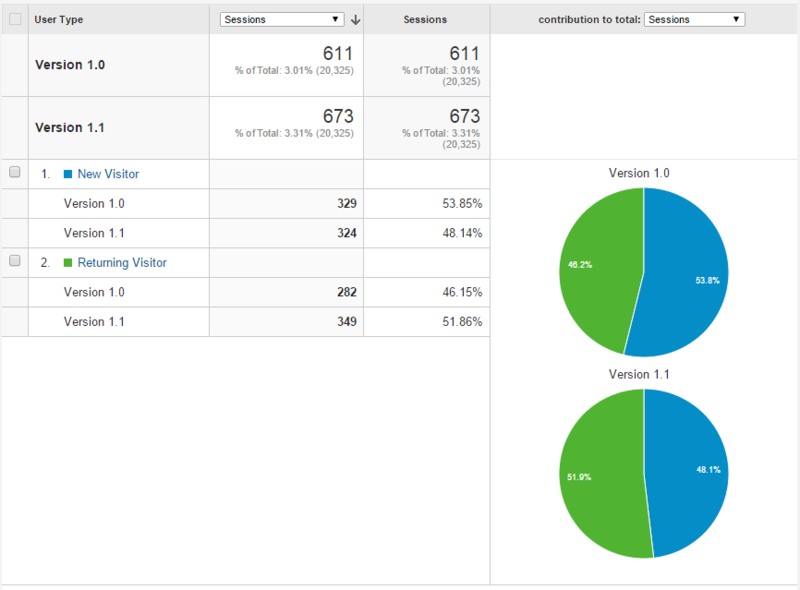 The average session duration increased to 8:20 which is a 273% growth compared with the starting point from version 1.0! We do not only gather the Google Analytics events but also we analyze them! We don’t encourage you to make poor game and update it, because in the long run it is not cost-effective. But we strongly encourage you to use Google Analytics and analyze the data you get!